Sam and Jason are ready to be married. Check out the day-to-day spoilers and a sneak peek video below to find out what's happening on ABC soap opera General Hospital during the week of September 5-9, 2016. ABC is airing an encore episode of GH from March 4, 2016: Nathan decides whether to confess to Maxie; Sonny's recommendation shakes Morgan; Nathan asks Dante for advice. Sabrina feels wary; Naomi tries to be there for her daughter; Nina urges Franco to confess. Elizabeth has an emergency; Ava is at fault for an incident she witnesses; Dillon moves forward. Valerie objects to Curtis; Dante and Lulu receive important information from Robert; Griffin tells Maxie he's sorry. New evidence surfaces; Carly extends an offer to Nelle; Morgan behaves erratically. In the sneak peek video below, Sam and Jason arrive for their wedding and are greeted by their closest friends and family members. 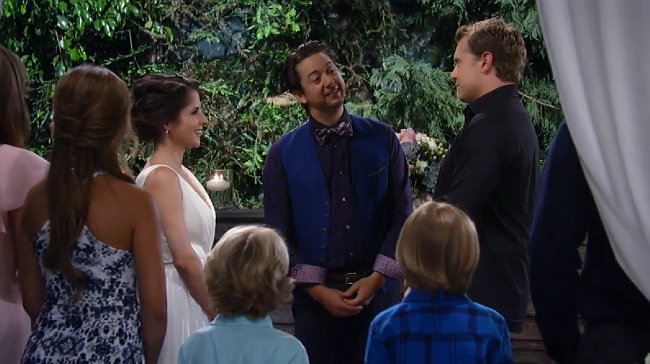 But Jason has one last surprise in store for the wedding: Spinelli has come back to town to officiate the ceremony.